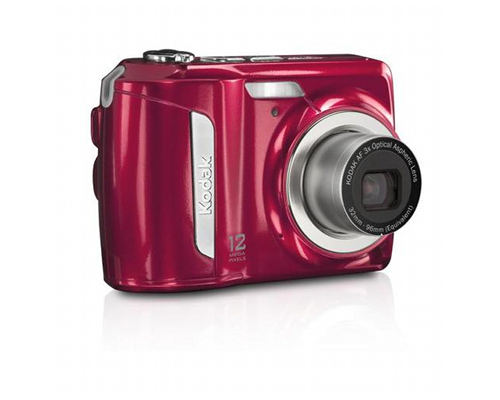 The Kodak EasyShare C143 is a fairly standard point and shoot digicam with a handful of features essentially expected of cameras like this one. A revision of the EasyShare C142 with a larger lens, it offers shots at an extremely low entry cost (as of this writing, less by a few dollars than the C142), making it potentially appealing though there is seemingly endless competition in that field. The camera measures 3.7" by 2.4" by 1.2" and weighs slightly over 6 ounces with batteries and an SD card, making it extremely lightweight and easy to transport in a pocket, in a case, or by any other means desired. The camera captures photos using a 12 effective megapixel 1 / 2.3" CCD capable of capturing a maximum resolution of 4026 by 3026. Its lens operates at the 35 mm equivalent of between 32 and 96 mm. It includes a 3x optical and 5x advanced digital zoom, and has a shutter speed of between 1/1400 and 1/8 seconds. Long exposures are possible between .5 and 8 seconds. Its LCD measures 2.7" in size and has 230000 dots, and it stores images on either 32MB of internal memory or via SD or SDHC memory cards. The camera includes a TTL-AF autofocus system that can be set to normal, macro, and infinity modes. The autofocus' range varies based on a number of settings: in normal focus, the autofocus's range is between 3.9' and infinity in wide and 1.2' and infinity in telephoto. In macro, the camera's range is between 3.9" and 31.5" in wide and 1.2' and 3.3' in telephoto. Its autofocus zones include multizone and center zone autofocus. The camera has an exposure control system. Its ISO sensitivity can be set between ISO 80 and ISO 400 in automatic modes and can be set manually to ISO 80, 100, 200, 400, 800, or 1600. The camera includes multipattern, center weighted, and face priority metering modes. It offers compensation between -2 and +2 exposure values, adjustable in 1/3 steps, and an auto exposure lock. White balance settings include automatic, daylight, tungsten, fluorescent, and open shade. The camera's flash has a range between .3 and 4 m at wide at an exposure of ISO 250 and a range between .5 and 2 m at telephoto at an exposure of ISO 250. Included modes are automatic, fill, red eye reduction, and off. The camera includes a 2-second or 10-second self-timer, a 2-shot mode, and a single-shot mode. It includes face detection and offers smart capture, program, scene, and video modes. Available scene modes include portrait, sport, landscape, close-up, flower, sunset, backlight, candlelight, children, manner/museum, text, beach, snow, fireworks, self portrait, night portrait, night landscape, blur reduction, hi-ISO, and panning shot. The camera captures still images in JPEG format using EXIF 2.21 compression. It can shoot photos in 3:2 at 4000 by 2664 (11 megapixels), in 4:3 at 1280 by 960 (1 megapixel), 2048 by 1536 (3 megapixels), 2880 by 2160 (6 megapixels), and 4000 by 3000 (12 megapixels), and in 16:9 at 1920 by 1088 (2 megapixels) and 4000 by 2248 (9 megapixels). The camera offers vivid, full, basic, sepia, and black and white color modes as well as high, normal and low sharpness settings. The camera includes an orientation sensor and timestamps, as well as on-camera editing. The camera shoots video using Quicktime JPEG-A with audio at a resolution of 640 by 480 and a framerate of 30 frames per second up to 4GB in size. The camera's date, time, sharing settings, LCD brightness, redeye settings, camera sound, video out, image storage, and language can all be customized. The share button allows users to easily upload photos to YouTube, Facebook, Flickr, Orkut, and Kodak Gallery. The camera has a USB 2.0 interface and is powered by AA-sized batteries (Ni-MH, lithium, or alkaline). It has a microphone and a 1/4" tripod mount, as well as PictBridge support. It also includes an AV output with support for both NTSC and PAL video formats. The camera, unlike many other inexpensive point and shoots, does not include support for shooting or editing HD video. I purchased this camera for one of my nieces. It will be for her graduation .I know she is gonna love it when she gets it in May. It takes beautiful pictures I must say. Will refer friends to this site. Many cases are available for the EasyShare C143, as is the Kodak Gorillapod camera tripod, the digital camera tripod, the mini tripod, and handheld tripod. A mini charger kit and replacement proprietary USB cables are also available if needed.